For Windows installation is the usual simple procedure: download the installation file, install CogStat, and you can start it from the Start menu. For Linux and Mac installation see this description. Use some sample data. 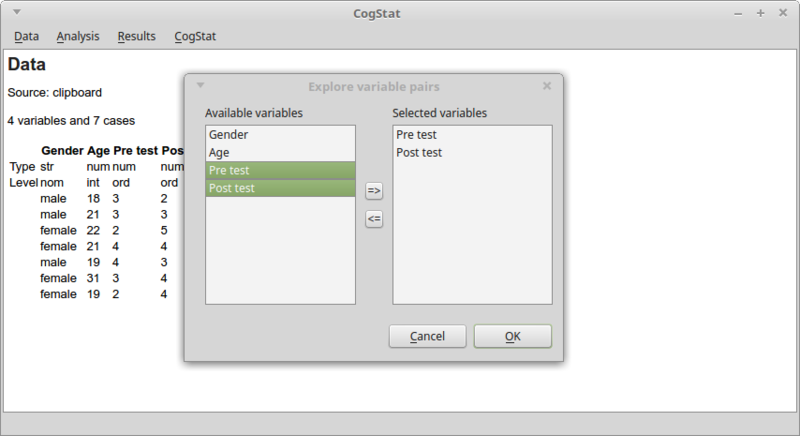 If this is the first time you run CogStat and you want to test it quickly, you might use the sample data, stored as CogStat .csv files or as SPSS .sav files. From the Data > Open data file... menu, choose the sample_data folder from the installation folder, and choose any .csv or .sav file there or in the subfolders, and click the Open button. Prepare your data. Unlike most statistical software, CogStat will not handle your data editing tasks, because there are more efficient solutions for that. You can use either SPSS (or the free SPSS clone, PSPP) or spreadsheet software (such as Excel, Google Spreadsheet or LibreOffice Calc) to store your data. Option 1: Use SPSS to store your data. It is important that you should set the measurement levels of your variables before importing them to CogStat, otherwise CogStat may handle them incorrectly. After saving your data in SPSS, to open the data, simply use the Data > Open data file... menu or drag and drop the file to the CogStat window. 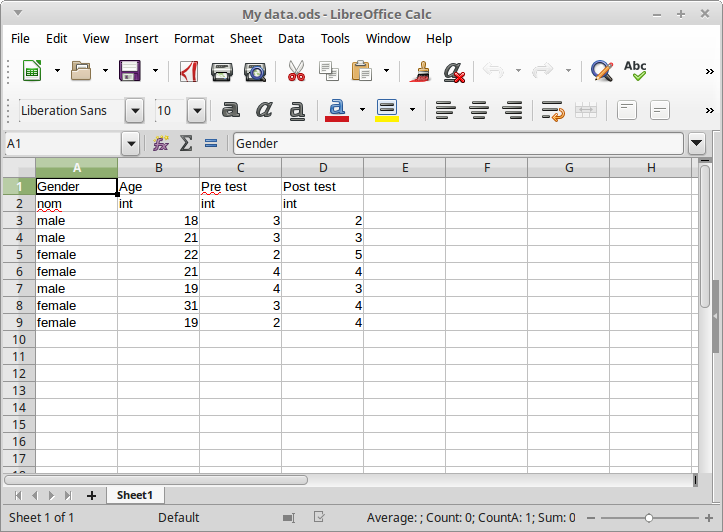 Option 2: Use your spreadsheet editor for handling your data. So use your LibreOffice Calc, MS Excel, Google Spreadsheet or other spreadsheet software to handle your data. First, this seems a bit unusual, but in fact, many times it is more efficient than using the data editors of the statistical software packages. Add names and measurement levels to your data: (1) In your data, the first row should include the variable names (preferably use only the English alphabet). 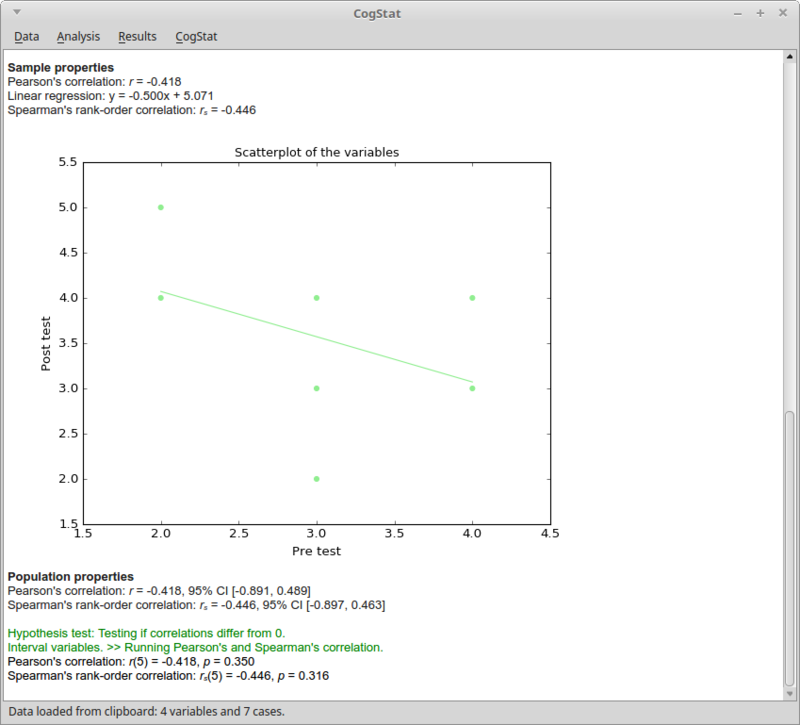 (2) Unlike in most statistical software packages, in CogStat you should set the measurement level of your variables. This is essential, because CogStat will choose automatically the most appropriate analyses partly based on this information. If you set the measurement level incorrectly, CogStat might give you inaccurate or improper results. So, the second row should include the measurement level of those variables: int, ord or nom for interval (or ratio), ordinal and nominal variables. (3) The rest of the lines should include the values of the variables. Finally, import your data. The simplest way to bring your data to CogStat is to copy and paste it: select your data in the spreadsheet software, copy it, and paste it to CogStat. Another way is to save your data in csv format from your spreadsheet software, and open it in CogStat. Run an analysis. In the Analysis menu you find all the available analysis possibilities. Choose the task from the menu (note that you’ll not see specific test names, chart names and the like in the menu, but only some tasks), then choose the appropriate variables, and in some rare cases set some options, and you’re good to go. All other works will be done by CogStat. Look at your results. 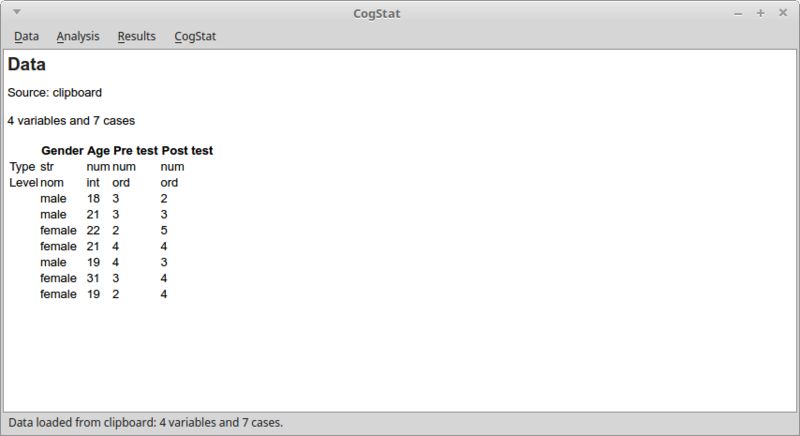 The results are compiled automatically by CogStat. These analyses include a lot of tweaks to have a more meaningful, intuitive and informative results. For example, most analyses include the raw data, sample properties and population properties sections, with which it is much easier to review and interpret your results. As another example, the chart axes reflect the measurement level of that variable. See the help pages of the analyses to find the detailed description about what is displayed and why. Changing the analyses to run. CogStat will choose the appropriate analyses, charts, parameters, etc. automatically. What to do if you’d want to change it? Well, most of the time you just can’t. CogStat is built up to include the best data analysis practices. More flexibility is one of the reasons why many results in the literature are unreliable (even if the researchers do not realize that flexibility in the data analysis will lead to lower quality results). So most of the choices cannot be changed. If you think that you need another hypothesis test, statistics, etc., (a) you might be wrong, and it is worth to think about whether your wanted solution is really an appropriate one, or (b) we might be wrong, or CogStat might be incomplete for that task, and you can ask for a new feature or report a bug. Storing the result. You can save the output from the Result menu in pdf format. Many times it is possible that you don’t even need to save your result, but you might just copy and paste the relevant parts to your report or spreadsheet. Also, it often might be easier to copy your data and run the analysis again, than to look for the saved pdf file and to look for the relevant part in the output (note again, that in CogStat most analyses need only a few clicks). How to compile the results? How to search this documentation? Ask any questions about CogStat on our user mailing list.